Bronx News 12 on Mar 30, 2018. Chefs from as far as Canada gathered at Fordham University Friday for a culinary event aimed at offering more plant-based meals at universities. 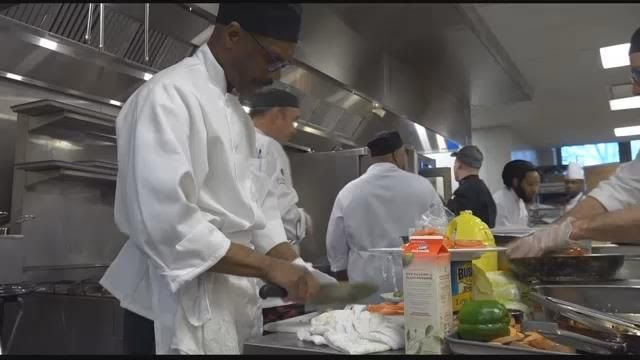 Food services provider Aramark brought together more than 20 of its chefs from campuses it services to train them on preparing plant-based foods. Chefs were put into groups to cook some of Aramark’s recipes and also to come up with their own. One of the most popular dishes of the day was a vegan sushi that uses vegetables like tomatoes and sweet potatoes to mimic the raw fish. The creator of that dish, Daniel Poulin, hails from Carlton University in Canada. Organizers say it all comes down to giving students more options.